Sunstar’s CEO Andrew Fraser has been presented with the 2016 NSW Government Community Service Award. Andrew was presented the award by NSW Premier Mike Baird at Manly Warringah Cricket Club’s annual presentation dinner. The Premier released the following statement. “Andrew has made an exceptional contribution to both the cricket club and the wider Manly community. 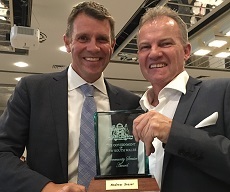 In his role as Honorary President of Manly Cricket Club over the past 13 years, Andrew has helped shape hundreds of young cricket players to be responsible, community minded young men,” said Premier Baird.